The paramount chief of Aflao, Torgbe Amenya Fiti IV is very upset with the Chief Justice, Sophia Akuffo and is asking her to take the necessary steps to also evacuate residents in the area where the dilapidated circuit court is situated as it poses a serious threat to their lives. Torgbe Fiti who expressed disappointment in the decision of the Chief Justice for closing down the court he inaugurated some 5 years ago said “why close down a court because of unsafe environment as the reason? There are residents in that area who are equally are human beings and have settled there for life unlike the court staff who spend few hours in a day in that environment”. He continued, “there is school in that place to, the chief justice should close the school and evacuate the people”. Torgbe Fiti’s outrage comes at the back of a directive from the office of the Chief Justice for the closure of Circuit and district courts in Aflao in the Ketu South municipality with effect from March 31, 2019 and all pending cases transferred to Keta and Agbozume for continuation. Judges in this respective courts gave been transferred. Per the letter, His Honour Ali Baba Abature has been transferred to circuit court ‘4’ in Adum-Kumasi in the Ashanti region. 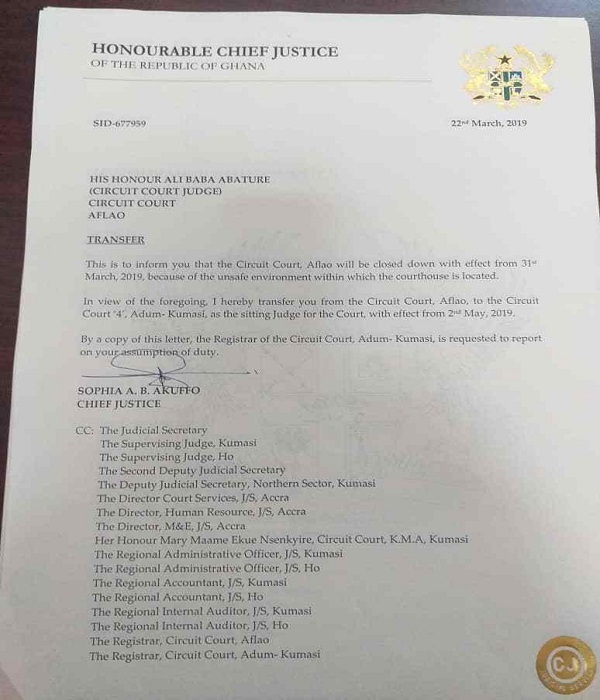 The letter reads in part “This is to inform you that the circuit court, Aflao will be closed down with effect from 31 March, 2019 because of the unsafe environment within which the courthouse is located”. The circuit court that serves the people of Aflao and its enclave has been shut down due to dust from the main Diamond cement road which has painted the court brown. Torgbe believes it’s the duty of government to fix the deplorable road and not his citizens nor the company which has fulfilled its tax obligations over the years to government. In an interview with this portal, Torgbe is hopeful his intended engagement with the Chief Justice should cause her to rescind her decision. “I was not informed in anyway by the CJ rather, it was the MCE that got the information to me. The CJ during her earlier notice to me prior to her tour to my traditional area indicated she will pay a courtesy call on me but didn’t only to be closing the courts for reasons not known to me”. The paramount chief stated that he donated the land for the judicial service to build the court on it after surveying the land and the environment. A visit to the court on April 1 indicates inactivity in the court with notice clipped to the entrance “The court is closed effect from 31 March, 2019. All cases have been transferred to Keta”.